Zdeněk Tomíček (CEE Attorneys): A lawyer can’t be a Partner unless he delivers a sufficient amount of work. In this interview, we asked Zdeněk Tomíček how it’s possible to build an international law firm in five countries, how can one reach customers abroad and how important it is to fairly reward bringing along new clients. Three years ago, Tomíček founded his own law firm Tomíček Legal which he upgraded to CEE Attorneys a year later. The international company now employs nearly 4O lawyers in four European countries. We asked Judr. Zdeněk Tomíček how he runs his firm and what was the key to a succesful expansion of his network. Prior to starting his own business, Tomíček worked for DLA Piper and PwC Legal. At DLA Piper, he was gaining valuable work experience at their London office. Today, a firm he co-founded has branches in four countries — the Czech Republic, Slovakia, Poland and Lithunia. In September, a new subdivision will open in Romania whereas negotiations to start yet another one are being held in Bulgaria. CEE Attorneys advocates in the Czech Republic and Slovakia use SingleCase for time accounting and manager reporting. First of all, let’s make SingleCase blog readers familiar with the way your company works. CEE Attorneys operates as a quasi-franchise — constituent offices are corporately independent of each other. However, we all use the same corporate identity, we abide by the same house style manual and inter-company relations are regulated by a co-operation agreement. We do everything to provide our clients with a high-quality service that we make a point of. Each of our offices therefore has to comply with CEE Attorneys quality criteria. These criteria focus mainly on the length of lawyers’ professional experience, their language abilities and also on proffesional responsibility insurance limits or mininal amount of lawyers at one office. That is pretty much what CEE Attorneys is about. Why did you decide to work as a quasi-franchise? In my opinion, a quasi-franchise operation model is somewhat neglected in the legal services market. International law firms are established either by acquiring local offices and minor transnational companies or by setting up subdivisions in foreign countries. However, this style, typical for major foreign law firms that used to come to the Czech Republic in the 1990’s is costly and doesn’t really encourage lawyers who decide to offer their built-up experience to these companies and work for a brand which is not their own. In my point of view, the style we have chosen is convenient for all parties because all pros of an international firm such as network clients, mutual marketing, business activities or IT are not built at the expense of free-decision making on the part of lawyers who had spent years buidling up their offices and then became CEE Attorneys members. Besides us, an Austrian firm called CHSH which operates as CHSH Kališ & Partners in the market, has opted for the same model. The only significant difference between us and CHSH is that CEE Attorneys is originally a Czecho-Slovakian brand and that’s we’ve decided to export it. However, what clearly distinguishes us from other companies in the market is our price policy which guarantees the clients that a price arrangement set by any of our offices will be fully respected by other branches. In other words, if our clients expand to foreign markets, they don’t have to worry about prices of legal services in Romania or Poland, because they can make sure that at CEE Attorneys, they will always get the same high quality care for the same amount of money. Indeed, our clients always sign a single contract that covers cooperation with all our offices. What was the reason to change the brand from Tomíček Legal to CEE Attorneys? I co-founded Tomíček Legal with three former colleagues from PwC Legal. Besides that, I used to work for DLA Piper in the Czech Republic and in London as well. My colleague Lukáš Petr worked at the biggest Czech law firm Havel Holásek & Partner. 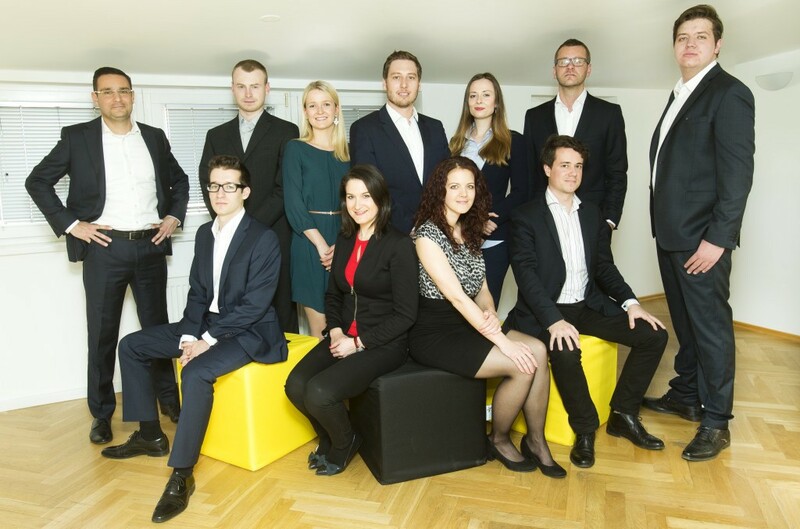 We all have valuable experiance from either international or major Czech law firms. Eventually, we couldn’t resist our mutual desire to work at an international law firm that would be our own and that’s how Tomíček Legal became CEE Attorneys. If you decide to focus on big corporate clients in today’s globalized world, you need to reflect the environment in your region. Our international clients often asked for legal services in Slovakia or Poland and we always wanted to satisfy them. Therefore we cooperated with other legal firms that we had good relations and positive experience with. However, at the end of the day it meant that services for our clients were simply conducted by someone else. Apparently, the form or quality of the conducted work may have differed from what we were offering and we also risked that in the future, other international firms would try to “drag” our clients in the Czech republic. So the motivatioan to start an international law firm was, first and foremost, protecting your own clients? It was only one of the reasons. The second one was our aforementioned work experience from international law firms and the knowledge of their advantages. I think that anyone who has ever worked in an international law firm realizes that getting work through a network is the easiest way of business development and acquiring new clients. Last but not least, international law firm’s environment has a significant impact on the personal aspect of the firm’s work. In my opionion, we’ve got to a phase when it’s really hard to find competent young professionals or, more precisely, to distinguish between those who are really capable and those who are good at marketing themselves but eventually have very little to offer. On top of that, law graduates’ requirements are often far-fetched considering their actual skills. Unfortunatelly, the problem partly stems from the shortcomings of Czech educational system and unjustified ego. The popular job interview question “What can you offer us?” has shifted form employers to applicants who are sometimes convinced that the world needs them. If we shift our focus from young people’s basic life-work balancerequirements, we can observe a dual motivation when they look for a new job. First, they look for above-average wages. In this respect however, we could observe a significant decline over the past few years and a radical drop caused by the financial crisis in the years 2008–2009 hasn’t yet been equalized. Second part of the motivation is mostly big or international law firm brand which makes recruiting competent young professionals extremely hard for small local law firms. Within our job interviews, we see that we have opted for the right way — the applicants realize that we are an established international law firm and the number of excellent people we have the chance to try is therefore rapidly increasing. How did building up the international network actually start? Logically, our first step towards international expansion led to Slovakia. The Czech market is small, as well as the Slovakian and Hungarian markets repsectively. Within my parallel acting in the Tradesman Association directorate, I understood a long time ago that the Czech market is, to a certain extent, a matter of the past and that the Visegrad Four market should slowly be becoming the smallest unit. In Slovakia, we negotiated with five different law firms that our clients or former colleagues recommended us. In the final phase, we had to decide between a highly established firm that had been in the market for more than fifteen years and a smaller, younger, yet very progressive firm. I would like to note here that our leading partner from the aforementioned big Slovakian law firm found the operation scheme we were introducing very interesting and he saw it as a great way to expand one’s activities abroad. However, we eventually decided to cooperate with the latter firm which we felt was closer to our philosophy and seemed ready to share our path and our future development. As for other countries, we have chosen the same strategy. Are the constituent law offices similar to each other? Do you choose firms with a similar firm culture and dynamics? We are always looking for a young team. I’m 33, our oldest colleague in Prague is just 39. The world is changing rapidly and it’s sometimes difficult to explain how to conduct business or how to use social networks in the 21st century even to a 50-year-old. To make things work effectively, a team should consist of people from the same generation. In this respect, we have been successful thus far. It is also very improtant that we share the same philosophy regarding attitude to a client. We all need to agree on the fact that quality of our work is more important then gain because it’s the quality together with our network that generates most of our new customers. We also realize that we don’t have to stick to high rates when conducting usual legal work which doesn’t require above-standard knowledge and high added value. When we set up a company, for instance, our commission is often much lower than when we prepare contracts for developers or clinical studies contracts. How does handing over your contrats work? Looking at the countries in your network, I guess that you pass on most of the contracts to your foreign partners and not vice-versa, am I right? Today, cooperation with our our Polish partners works particularly well, which we had expected. I dare say that they actually gave us more work then we gave to them. In general, I think that only a handful of Czech law firms focus on Polish market which makes it extremely underused. There are about 35O Czech companies doing business in Poland and about 35OO Polish companies doing business in the Czech republic. That offers a great potential for providing legal services. Due to this, we acquire one to two Polish clients a month. That’s a good result, isn’t it? How do you choose countries to which you want to expand your business? In our firm, we agreed that until the end of 2018, we would like to cover most of Central and Eastern European countries, from Estonia to Bulgaria. These are the countries where we are able to find an hour-rate point of intersection which is a crucial aspect for us. At the beginning, we were indeed considering an expansion towards Austria or Germany but we soon realized that such an enterprise would ruin our concept. I often recall our negotiations in Vienna where the leading partner of the Austrian law firm who, by the way, really liked our concept, informed us nobly that in order to avoid any obstacles to our future cooperation, would be willing to reduce the minimum hour rate to 250 EUR. That’s where our discussion ended. In case our plan is accomplished, we would also like to expand further East to post-Soviet countries. We’ve already started negotiations in Ukraine, Belarus and Russia. Could you make our readers familiar with the CEE Attorneys legal system? At every office, there is always a so-called Decision Making Partner who is qualified to make decisions on its behalf. Common issues are usually discussed once in two weeks through a teleconference. Matters of firm philosphy and general development of CEE Attorneys are talked over at regular partner meetings that take place twice a year. At the moment, we are preparing for a meeting in Munich. We also get to see our partners within teambuilding and business events to which we invite each other. We could hardly celebrate CBRE 15th anniversary in the Polish market unless we had a nice office there. Another commonly discussed topic is appointing partners. How do you do it at your firm? First and foremost, we abide by a fundamental rule that unless an advocate brings along sufficient amount of work, he can’t be a partner no matter how skillful he is. It stems not only from our basic perception of business but also from the fact that we actually own the firm. We don’t trust in different schemes — even if they are functional — whether we talk about foreign international firms where “partner” has eventually evolved into a mere post or about one of the new schemes in which simply everyone is a partner. To us, the word “partner” means primarily a commitment to sustain the firm and its staff. Potential benefits and profit are a secondary issue. In my opinion, unfortunately, people barely realize this nowadays. Everyone wants to be a partner and advance within the internal hierarchy but doesn’t necessarily realize that it also brings about huge responsibility. No strings attached. See how you can grow your business with SingleCase.